Who can share content with the corporate Library? In a corporate Academy the Admin decides which group of users can create corporate courses (i.e. create courses and connect them with the Academy). 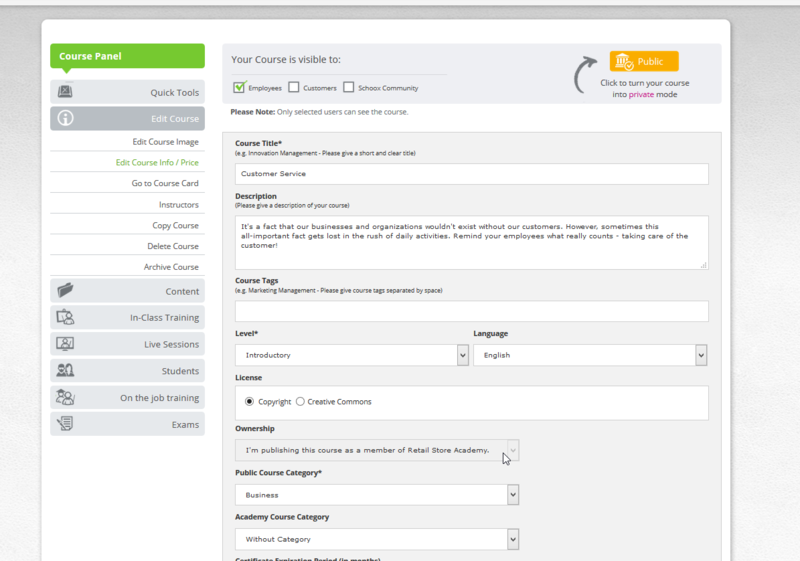 By default only Admins and Training Managers can create corporate courses. But the admin can give authorization also to employees to be able to create corporate courses. If you have been given the authorization to create courses for your corporate Academy you are a member of as an employee you will see this Academy listed in the "Ownership" menu on the Edit Info page when you create the course. In case employees are not authorized to create courses in your corporate Academy you can ask your Admin to make you a Training Manager. Please Note: While you are a member of an Academy you are also a member of schooX's community. This gives you the right to create courses anytime and share it with others. You just need authorization from your corporate Admin to connect a course with your Academy so that it is listed as a corporate course within the corporate Academy.